In this long-awaited fifth novel in the saga, their path takes them to the outskirts of Calla Bryn Sturgis, a tranquil valley community of farmers and ranchers on Mid-World's borderlands. Beyond the town the rocky ground rises towards the hulking darkness of Thunderclap, the source of a terrible affliction that is slowly stealing the community's soul. One of the town's residents is Pere Callahan, a ruined priest who, like Susannah, Eddie and Jake, passed through one of the portals that lead both into and out of Roland's world. 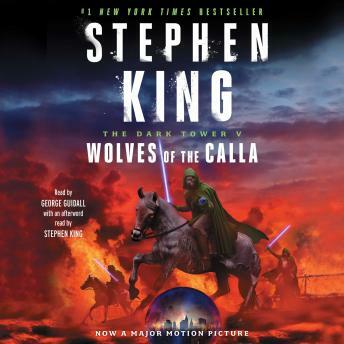 Not the best of the 7 but a great addition to the dark tower series. I've read all 7 books twice but this is my first time through on audio. I love Frank Muller narration but George G dose a really good job. Half way through this long and engrossing series the really great narrator who does the first four books dies. The new guy is ok but without the nuance or vividness of the previous. Great series. I prefer the voices portrayed by Frank Muller. This is my second time through the series. I have never before read any book let alone an entire series. It is much, much better the second time though. I could not believe how much I missed or did not connect the first time. Good continuation of the series. Still some parts are King drunk and blathering on. Great listen. Amazing story, and the narration is really good. Amazing story. I cannot for the life of me figure out how Stephen King writes such fantastically intertwined stories, using his old writings with his new. Blows my mind.